The FAS receptor (FasR), also known as apoptosis antigen 1 (APO-1 or APT), cluster of differentiation 95 (CD95) or tumor necrosis factor receptor superfamily member 6 (TNFRSF6) is a protein that in humans is encoded by the FAS gene. 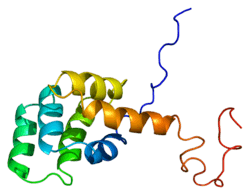 The mature Fas protein has 319 amino acids, has a predicted molecular weight of 48 kiloDaltons and is divided into 3 domains: an extracellular domain, a transmembrane domain, and a cytoplasmic domain. The extracellular domain has 157 amino acids and is rich in cysteine residues. The transmembrane and cytoplasmic domains have 17 and 145 amino acids respectively. Exons 1 through 5 encode the extracelluar region. Exon 6 encodes the transmembrane region. Exons 7-9 encode the intracellular region. Fas forms the death-inducing signaling complex (DISC) upon ligand binding. Membrane-anchored Fas ligand trimer on the surface of an adjacent cell causes oligomerization of Fas. Recent studies which suggested the trimerization of Fas could not be validated. Other models suggested the oligomerization up to 5-7 Fas molecules in the DISC. This event is also mimicked by binding of an agonistic Fas antibody, though some evidence suggests that the apoptotic signal induced by the antibody is unreliable in the study of Fas signaling. To this end, several clever ways of trimerizing the antibody for in vitro research have been employed. Upon ensuing death domain (DD) aggregation, the receptor complex is internalized via the cellular endosomal machinery. This allows the adaptor molecule FADD to bind the death domain of Fas through its own death domain. FADD also contains a death effector domain (DED) near its amino terminus, which facilitates binding to the DED of FADD-like interleukin-1 beta-converting enzyme (FLICE), more commonly referred to as caspase-8. FLICE can then self-activate through proteolytic cleavage into p10 and p18 subunits, two each of which form the active heterotetramer enzyme. Active caspase-8 is then released from the DISC into the cytosol, where it cleaves other effector caspases, eventually leading to DNA degradation, membrane blebbing, and other hallmarks of apoptosis. Recently, Fas has also been shown to promote tumor growth, since during tumor progression, it is frequently downregulated or cells are rendered apoptosis resistant. Cancer cells in general, regardless of their Fas apoptosis sensitivity, depend on constitutive activity of Fas. This is stimulated by cancer-produced Fas ligand for optimal growth. Although Fas has been shown to promote tumor growth in the above mouse models, analysis of the human cancer genomics database revealed that FAS is not significantly focally amplified across a dataset of 3131 tumors (FAS is not an oncogene), but is significantly focally deleted across the entire dataset of these 3131 tumors, suggesting that FAS functions as a tumor suppressor in humans. In cultured cells, FasL induces various types of cancer cell apoptosis through the Fas receptor. In AOM-DSS-induced colon carcinoma and MCA-induced sarcoma mouse models, it has been shown that Fas acts as a tumor suppressor. Furthermore, the Fas receptor also mediates tumor-specific cytotoxic T lymphocyte (CTL) anti-tumor cytotoxicity. Some reports have suggested that the extrinsic Fas pathway is sufficient to induce complete apoptosis in certain cell types through DISC assembly and subsequent caspase-8 activation. These cells are dubbed Type 1 cells and are characterized by the inability of anti-apoptotic members of the Bcl-2 family (namely Bcl-2 and Bcl-xL) to protect from Fas-mediated apoptosis. Characterized Type 1 cells include H9, CH1, SKW6.4 and SW480, all of which are lymphocyte lineages except the latter, which is a colon adenocarcinoma lineage. However, evidence for crosstalk between the extrinsic and intrinsic pathways exists in the Fas signal cascade. In most cell types, caspase-8 catalyzes the cleavage of the pro-apoptotic BH3-only protein Bid into its truncated form, tBid. BH-3 only members of the Bcl-2 family exclusively engage anti-apoptotic members of the family (Bcl-2, Bcl-xL), allowing Bak and Bax to translocate to the outer mitochondrial membrane, thus permeabilizing it and facilitating release of pro-apoptotic proteins such as cytochrome c and Smac/DIABLO, an antagonist of inhibitors of apoptosis proteins (IAPs). ↑ Lichter P, Walczak H, Weitz S, Behrmann I, Krammer PH (September 1992). "The human APO-1 (APT) antigen maps to 10q23, a region that is syntenic with mouse chromosome 19". Genomics. 14 (1): 179–80. doi:10.1016/S0888-7543(05)80302-7. PMID 1385299. ↑ Inazawa J, Itoh N, Abe T, Nagata S (November 1992). "Assignment of the human Fas antigen gene (Fas) to 10q24.1". Genomics. 14 (3): 821–2. doi:10.1016/S0888-7543(05)80200-9. PMID 1385309. ↑ Wajant H (2002). "The Fas signaling pathway: more than a paradigm.". Science. 296 (5573): 1635–6. doi:10.1126/science.1071553. PMID 12040174. ↑ "OrthoMaM phylogenetic marker: FAS coding sequence". ↑ Izquierdo JM, Majós N, Bonnal S, Martínez C, Castelo R, Guigó R, Bilbao D, Valcárcel J (August 2005). "Regulation of Fas alternative splicing by antagonistic effects of TIA-1 and PTB on exon definition". Mol. Cell. 19 (4): 475–84. doi:10.1016/j.molcel.2005.06.015. PMID 16109372. ↑ Wang; et al. (2010). "The Fas–FADD death domain complex structure reveals the basis of DISC assembly and disease mutations". Nat Struct Mol Biol. 17 (11): 1324–29. doi:10.1038/nsmb.1920. PMID 20935634. ↑ Huang B; et al. (1996). "NMR structure and mutagenesis of the Fas (APO-1/CD95) death domain". Nature. 384 (6610): 638–41. doi:10.1038/384638a0. PMID 8967952. ↑ Eberstadt M; et al. (1998). "NMR structure and mutagenesis of the FADD (Mort1) death-effector domain". Nature. 392 (6679): 941–5. doi:10.1038/31972. PMID 9582077. ↑ Chen L, Park SM, Tumanov AV, Hau A, Sawada K, Feig C, Turner JR, Fu YX, Romero IL, Lengyel E, Peter ME (May 2010). "CD95 promotes tumour growth". Nature. 465 (7297): 492–6. doi:10.1038/nature09075. PMC 2879093 . PMID 20505730. ↑ Liu F, Bardhan K, Yang D, Thangaraju M, Ganapathy V, Liles G, Lee J, Liu K (June 2012). "NF-κB directly regulates Fas transcription to modulate Fas-mediated apoptosis and tumor suppression". J Biol Chem. 287 (30): 25530–40. doi:10.1074/jbc.M112.356279. PMID 22669972. ↑ Yang D, Torres CM, Bardhan K, Zimmerman M, McGaha TL, Liu K (May 2012). "Decitabine and vorinostat cooperate to sensitize colon carcinoma cells to Fas ligand-induced apoptosis in vitro and tumor suppression in vivo". J. Immunol. 188 (9): 4441–9. doi:10.4049/jimmunol.1103035. PMID 22461695. 1 2 3 Gajate C, Mollinedo F (March 2005). "Cytoskeleton-mediated death receptor and ligand concentration in lipid rafts forms apoptosis-promoting clusters in cancer chemotherapy". J. Biol. Chem. 280 (12): 11641–7. doi:10.1074/jbc.M411781200. PMID 15659383. 1 2 3 MacFarlane M, Ahmad M, Srinivasula SM, Fernandes-Alnemri T, Cohen GM, Alnemri ES (October 1997). "Identification and molecular cloning of two novel receptors for the cytotoxic ligand TRAIL". J. Biol. Chem. 272 (41): 25417–20. doi:10.1074/jbc.272.41.25417. PMID 9325248. 1 2 Shu HB, Halpin DR, Goeddel DV (June 1997). "Casper is a FADD- and caspase-related inducer of apoptosis". Immunity. 6 (6): 751–63. doi:10.1016/S1074-7613(00)80450-1. PMID 9208847. ↑ Vincenz C, Dixit VM (March 1997). "Fas-associated death domain protein interleukin-1beta-converting enzyme 2 (FLICE2), an ICE/Ced-3 homologue, is proximally involved in CD95- and p55-mediated death signaling". J. Biol. Chem. 272 (10): 6578–83. doi:10.1074/jbc.272.10.6578. PMID 9045686. ↑ Pan G, O'Rourke K, Chinnaiyan AM, Gentz R, Ebner R, Ni J, Dixit VM (April 1997). "The receptor for the cytotoxic ligand TRAIL". Science. 276 (5309): 111–3. doi:10.1126/science.276.5309.111. PMID 9082980. ↑ Huang B, Eberstadt M, Olejniczak ET, Meadows RP, Fesik SW (1996). "NMR structure and mutagenesis of the Fas (APO-1/CD95) death domain". Nature. 384 (6610): 638–41. doi:10.1038/384638a0. PMID 8967952. ↑ Chinnaiyan AM, O'Rourke K, Tewari M, Dixit VM (May 1995). "FADD, a novel death domain-containing protein, interacts with the death domain of Fas and initiates apoptosis". Cell. 81 (4): 505–12. doi:10.1016/0092-8674(95)90071-3. PMID 7538907. ↑ Thomas LR, Stillman DJ, Thorburn A (September 2002). "Regulation of Fas-associated death domain interactions by the death effector domain identified by a modified reverse two-hybrid screen". J. Biol. Chem. 277 (37): 34343–8. doi:10.1074/jbc.M204169200. PMID 12107169. ↑ Micheau O, Tschopp J (July 2003). "Induction of TNF receptor I-mediated apoptosis via two sequential signaling complexes". Cell. 114 (2): 181–90. doi:10.1016/S0092-8674(03)00521-X. PMID 12887920. ↑ Starling GC, Bajorath J, Emswiler J, Ledbetter JA, Aruffo A, Kiener PA (April 1997). "Identification of amino acid residues important for ligand binding to Fas". J. Exp. Med. 185 (8): 1487–92. doi:10.1084/jem.185.8.1487. PMC 2196280 . PMID 9126929. ↑ Schneider P, Bodmer JL, Holler N, Mattmann C, Scuderi P, Terskikh A, Peitsch MC, Tschopp J (July 1997). "Characterization of Fas (Apo-1, CD95)-Fas ligand interaction". J. Biol. Chem. 272 (30): 18827–33. doi:10.1074/jbc.272.30.18827. PMID 9228058. ↑ Jung YS, Kim KS, Kim KD, Lim JS, Kim JW, Kim E (October 2001). "Apoptosis-linked gene 2 binds to the death domain of Fas and dissociates from Fas during Fas-mediated apoptosis in Jurkat cells". Biochem. Biophys. Res. Commun. 288 (2): 420–6. doi:10.1006/bbrc.2001.5769. PMID 11606059. ↑ Okura T, Gong L, Kamitani T, Wada T, Okura I, Wei CF, Chang HM, Yeh ET (November 1996). "Protection against Fas/APO-1- and tumor necrosis factor-mediated cell death by a novel protein, sentrin". J. Immunol. 157 (10): 4277–81. PMID 8906799. ↑ Ryu SW, Chae SK, Kim E (December 2000). "Interaction of Daxx, a Fas binding protein, with sentrin and Ubc9". Biochem. Biophys. Res. Commun. 279 (1): 6–10. doi:10.1006/bbrc.2000.3882. PMID 11112409. Nagata S (1997). "Apoptosis by death factor.". Cell. 88 (3): 355–65. doi:10.1016/S0092-8674(00)81874-7. PMID 9039262. Cascino I, Papoff G, Eramo A, Ruberti G (2004). "Soluble Fas/Apo-1 splicing variants and apoptosis.". Front. Biosci. 1: d12–8. doi:10.2741/A112. PMID 9159204. Uckun FM (1998). "Bruton's tyrosine kinase (BTK) as a dual-function regulator of apoptosis.". Biochem. Pharmacol. 56 (6): 683–91. doi:10.1016/S0006-2952(98)00122-1. PMID 9751072. Krammer PH (2000). "CD95's deadly mission in the immune system.". Nature. 407 (6805): 789–95. doi:10.1038/35037728. PMID 11048730. Siegel RM, Chan FK, Chun HJ, Lenardo MJ (2001). "The multifaceted role of Fas signaling in immune cell homeostasis and autoimmunity.". Nat. Immunol. 1 (6): 469–74. doi:10.1038/82712. PMID 11101867. Yonehara S (2003). "Death receptor Fas and autoimmune disease: from the original generation to therapeutic application of agonistic anti-Fas monoclonal antibody.". Cytokine Growth Factor Rev. 13 (4-5): 393–402. doi:10.1016/S1359-6101(02)00024-2. PMID 12220552. Choi C, Benveniste EN (2004). "Fas ligand/Fas system in the brain: regulator of immune and apoptotic responses.". Brain Res. Brain Res. Rev. 44 (1): 65–81. doi:10.1016/j.brainresrev.2003.08.007. PMID 14739003. Poppema S, Maggio E, van den Berg A (2004). "Development of lymphoma in Autoimmune Lymphoproliferative Syndrome (ALPS) and its relationship to Fas gene mutations.". Leuk. Lymphoma. 45 (3): 423–31. doi:10.1080/10428190310001593166. PMID 15160902.